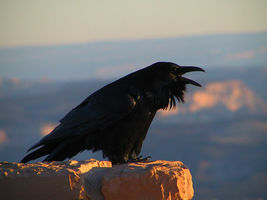 1 Ravens live throughout the northern hemisphere. They can adapt to all kinds of environments. They can be found in deserts and on the tops of mountains. Ravens are permanent residents of Alaska where they are able to survive the harsh winters. 2 Ravens are the largest all-black birds in the world. The average length of a raven is 24 inches. Their stately appearance makes them very visible. The "cawing" sound of their deep voices also makes their presence known. Ravens enjoy being around humans and often gather where people live. Ravens can make nuisances of themselves by scattering garbage around and stealing food that has been left out for family pets. 3 Ravens are experts at flying. They can soar through the air in an elegant way. They can hover in the air like helicopters. They can also perform twists and turns like stunt pilots in airplanes. Ravens are the acrobats of the air.